The polycarbonate terminal box range, DPCP, with a IP 66, 67 protection degree, is available off the shelf in many different sizes. The DPCP range is well suited for indoor and outdoor environments, even in locations where there is direct sunlight, thanks to the resistance to UV radiation. Water and dust are prevented from entering the terminal box, thus eliminating the risk for component failure, and with that, unnecessary downtime. Polycarbonate box, halogen-free, suitable for outdoor use. High UV radiation resistance. Self-extinguishing. IP 66, 67 | IK 08 (-25 °C … +35 °C). CE, GOST. For cULus_UL Listed approvals, please contact our sales department. Body, cover, cover screws manufactured from stainless steel, mounting screws and cover plugs made of polyamide. 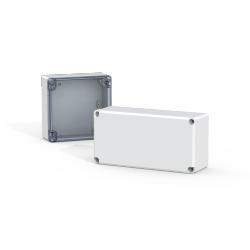 Polycarbonate terminal box, available in a wide range of sizes, with a high IP 66, 67 protection degree. Customers can choose terminal boxes that meet their size requirements, off the shelf. The installed components inside the terminal box will be safe and secure due to the high protection degree and resistance to UV radiation. Customers can receive terminal boxes with a short delivery time, that match their size requirements which can be installed in both indoor and outdoor environments, even in locations where there is direct sunlight. This will also remove any extra costs due to oversizing. Component failure and unnecessary downtime is avoided as water and dust are prevented from entering the terminal box. The mounting plate, DMP, and DIN profiles, DR, have to be ordered separately, in order to complete the installation of the terminal box.